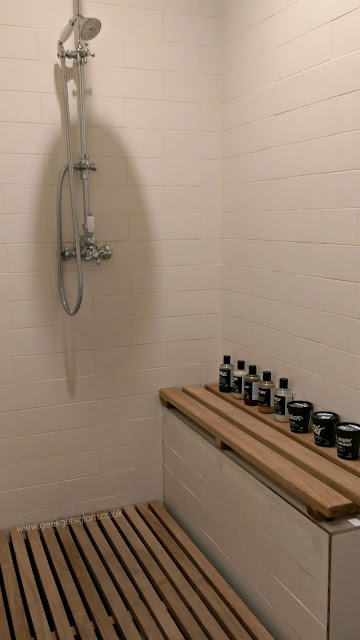 Since working for Lush, I've always been desperate to book into one of the Lush Spa stores and get one of the unique treatments they have to offer. The Synaesthesia treatment, an 80 minute full body massage, had always been the most intriguing to me because of how people described it - pick two words that jump out at you, and the rest you'll have to find out for yourself. Curiosity got the better of me and my lovely manager booked me in for a treatment at the Liverpool store. 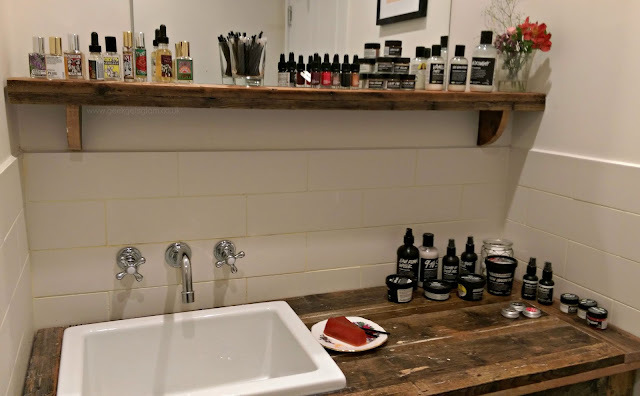 I'd heard that Lush spas were truly magical and the treatments were out of this world, so I was very excited to find out more. The staff at the Liverpool Lush branch were lovely. I was greeted straight away and they made me feel really comfortable while I was waiting for my treatment. I had no idea what the spa itself would be like and I was blown away when my spa therapist lead me into the spa area because it was exactly like an old English cottage. It's kind of set up like a countryside style kitchen/diner area and it's just beautiful. 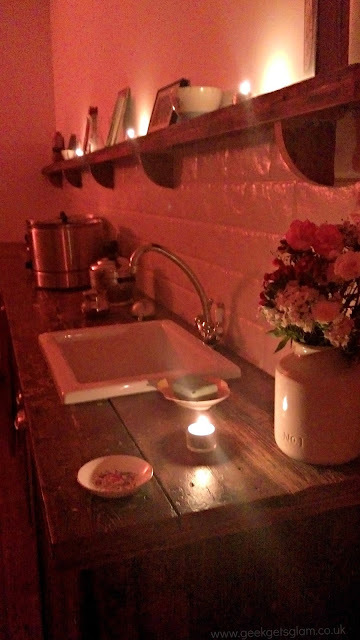 I felt a bit stupid taking photos of the spa area, and if I shared everything that would ruin the magic, but I did get some photos of the toilet area as I was having serious bathroom envy. I want their toilets in my house. And look at all the Lush goodies you can use after your treatment! Pure luxury - I was in heaven already! On the back wall of the spa, there are words that describe certain emotions. You are asked to chose one, whichever one stands out without thinking about it, and this will determine what massage oils you will have. the word 'uninhibited' stood out to me. While your treatment room is being set up, you can take your make up off and get comfy. Your also asked to take a look at a load of colourful bottles on the wall and, again, asked to pick one to really customise your treatment to however your mind feels. I couldn't take my eyes off a purple bottle which was 'Forgiveness' so I went for that one. Then it was time for my massage. I don't want to give too much away about the massage itself. I've never had a full body massage but the therapist made me feel really relaxed and comfortable. The massage itself was ridiculously relaxing... I kept dropping off to sleep! Every area of the body is massaged. I was worried about areas like my feet being tickly but it's more of a surface massage and it just feels like a foot rub if anything. My muscles were so relaxed after I struggled to get off the massage table haha! It has it's own special soundtrack too which is full of birds tweeting and it is heavenly. You can buy the spa soundtracks in all Lush shops and I'm getting one ASAP because it would be perfect music to listen to before bed. I've included one sneaky picture but that's all I'm letting you see - you HAVE to try this out for yourself! If you're after a super special and unique treat, I highly recommend the Lush spa treatments. I'm booking The Comforter? Treatment next! I keep hearing about the Lush spas and how amazing they are! The treatments seem really thought out and worth the money! I really want to visit one of their spas at some point..